A very welcome flute of Boizel – the house champagne specially bottled for the restaurant – accompanied by an array of elegant amuses-bouches, set the tone for another special evening at Ta’ Frenċ. Michelin-starred British chef Nigel Howarth, who is a member of the Royal Academy of Culinary Arts, was enticed to a working sojourn in Gozo by Frances Bissell, a former Times of London food writer, Fellow of the Royal Academy of Culinary Arts and for some time, among many other hats she wears, culinary consultant to Ta’ Frenċ. Fabian Etienne, freelance sommelier and wine consultant at Vini e Capricci, the wine purveyors for the evening, personally paired the wines with chefs Haworth and Mario Schembri and served them with detailed explanations to the captivated diners. Diners were shown to their tables on arrival and served promptly – the first of six exquisitely prepared courses: treacle-cured salmon, king prawn with pickled ginger and coriander, with the salmon cured to a ‘T’ and the prawn tasting as fresh as the sea one mile away. Cuvée Pietro Chiarlo, a non-vintage Metodo Classico, accompanied the first course and Condrieu ‘Mandouls’ 2016 from Ferraton, eased everyone gently to the soup – a foragers’ dream concoction of nettle, spinach, tarragon and wild garlic with a sheep’s milk cheese gnocchi. When one considers May being right at the edge of the season when the lack of rain is already being felt, finding wild ingredients is an achievement in itself. Blending them with classic British cuisine in this way is a triumph. Maitre d’ Joseph Tabone, keeping an eagle eye on the proceedings, moved smoothly from table to table making sure guests were happy. As the restaurant welcomed its last guests, the front of house brigade and the kitchen, in perfect synchronisation, served everyone with local rabbit and leek turnover, garnished with a splash of Piccalilli, while glasses were charged with Pecorino ‘Trabocchetto’ 2016 from Abruzzo. Wild seabass, charred lettuce and wood sorrel followed, accompanied by a crisp, minerally white Saint Joseph – ‘La Source’ 2016 from renowned Ferraton et Fils in the Rhône Valley. 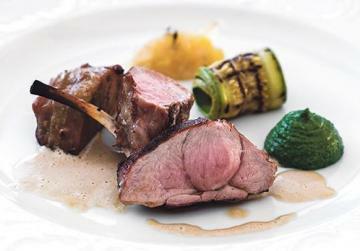 With impeccable timing, the main course was served to all tables practically simultaneously – lamb cooked three ways: leg, succulent rib and confit shoulder with spinach purée, rolled courgettes and a splash of lemon marmalade. Etienne came round to describe the exquisite Côte Rôtie ‘Montmain’ 2014 that had just been poured, its fruit and elegant tannins perfectly matching the melt-in-your-mouth meat. The final flourish was the cherry goats’ cheese cake with a cherry sorbet and basil. 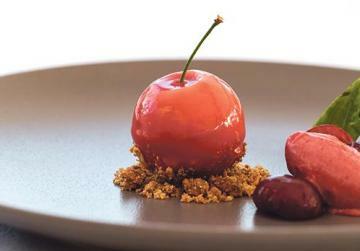 Disguised as a large cherry, complete with crimson glaze, this was a picture- perfect presentation well-matched with the delicate, low-alcohol Nicole Moscato d’Ast. At the end both chefs came out to greet guests individually and to present the white brigade which had toiled incessantly all week. It must have been hell in the kitchen. As guests lingered over digestifs, moving from the dining rooms to the bar, one could not help but dwell on the magic that is Ta’ Frenċ. Nigel Howarth is Chef Ambassador at Northcote, a luxury, independent 26-bedroomed country house hotel located in the Ribble Valley, Lancashire whose restaurant Nigel has helped hold a Michelin Star for over 20 years. 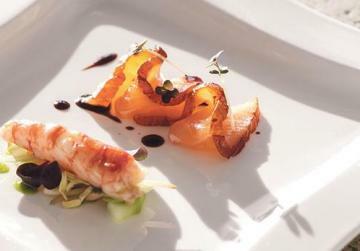 Ambrosial is the latest in a series of initiatives by Ta’Frenċ whereby world-renowned chefs are invited to team up with chef Mario Schembri to bring haute cuisine to the Maltese Islands.